Domed clusters of fragrant white flowers in April and May, opening from pink buds, followed by red fruit, and glossy, dark green leaves. 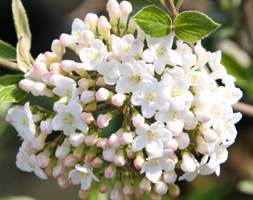 This Viburnum is one of the best scented varieties and is usually evergreen when the plant matures. To fully appreciate the fabulously fragrant flowers chose a partly shady border close to an entrance or path.